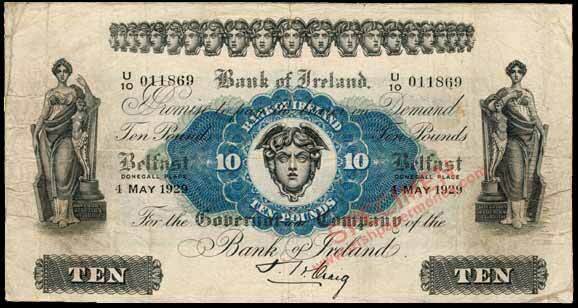 Bank of Ireland first Northern Ireland issue. This design was originated in 1922. 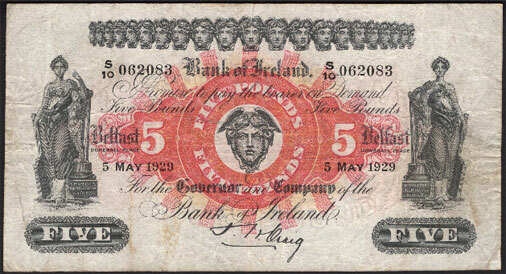 The place of payment was changed from Dublin to Belfast for the Northern Ireland issue. Otherwise the design remained largely unaltered. The design continued up to 1958, with just one major alteration. One Pound notes had their main colour changed from green to blue in 1936. 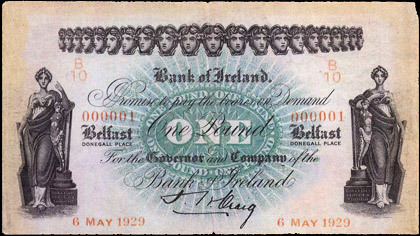 The £5 note with date 1 October 1958 was the final date of this series, and the last note of this classic design with the row of heads and two statues. Yes, it was the end of an era when this £5 note was issued. The first date of this core design of Twin Hibernias and Mercury Heads appeared in 1838, so the design lasted for around 120 years, a world record perhaps? 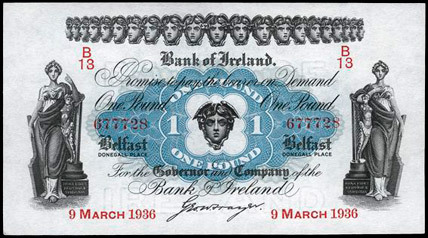 The next Northern Ireland series retained some elements of the classic design with the Mercury Heads but as a less prominent feature. The 1967 issue with printed signature of W.E.Guthrie as agent are scarce, particularly in high grade. The notes of this issue are undated. Last edited by DOC on 26 Sep 2018 22:38, edited 1 time in total. Here are examples of the £1 and £10 notes from the 1967 issue with the Guthrie signature. A larger format £5 note was also issued in 1968 with HHM Chestnutt as Agent, example attached. In 1971 to 1974, a new reduced size series was introduced with HHM Chestnutt as Manager. The following denominations were issued: £1, £5, £10 & £100. The £100 Chestnutt is scarce in any grade and rare in high grade. Replacement notes are known for all denominations except the £100. Specimen notes are also available to collectors. Examples of the £1 and £5 are attached. Here are examples of the Chestnutt £10 and £100. Here are examples of £1 and £5 replacement notes with the Chestnutt signature. Have we seen £10 replacements of these? PMI reports a range of up to 006170 for the £10 Chestnutt replacement note, so presumably at least 1 example (006170) is known. However, I have not seen one myself. It would be great to hear from someone who could provide a scan of this replacement note. Based on observation, this would appear to be a very rare note. Some of these small issue replacement notes acna be very tough to find in any grade, especially if they predate the mid-1970s, before people were looking for them in an organised manner. From 1977 to 1981, a new issue was introduced with ASJ O'Neill as Manager. The following denominations were issued: £1, £5, £10 & £100. Replacement notes are known for all denominations except the £100. Various types of specimen notes are also available to collectors. Examples of the standard issue notes are attached. Last edited by DOC on 24 Nov 2018 20:50, edited 1 time in total. Here is the £1 note with O'Neill signature. Here is an example of a replacement £10 note for the 1977 issue. Replacement notes are also known for the £1 and £5 notes of this issue but scans are hard to find ! Last edited by DOC on 19 Jan 2019 18:13, edited 1 time in total. In 1983, a new issue was introduced. 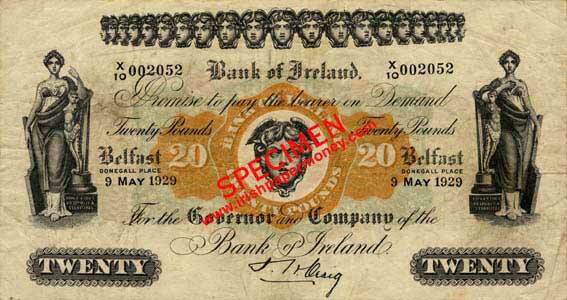 The O’Neill notes now bear the word Sterling in the promissory text and the ‘£’ sign is added to the value numerals. 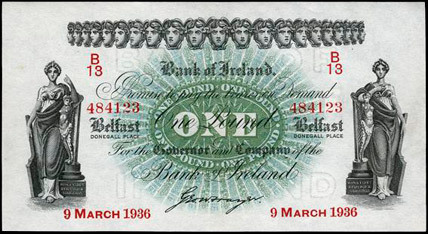 This change was made to reflect the breaking of the fixed link between the Pound Sterling and Irish Punt in 1979. The following denominations were issued: £1, £5, £10, £20 & £100. The £20 denomination was a new addition to commemorate the 200th Anniversary of the founding of the Bank and was the first time the denomination was issued since 1929. Standard issue, replacement and specimen notes of various types are available to collectors. Examples of the standard issue £1 and replacement £1 are attached. These were the last £1 notes issued by the Bank bringing an end to a denomination issued by it for more than 180 years. Here are examples of the Sterling Issue £5 notes with the O'Neill signature, standard type and replacement. The £5 replacement note is quite scarce. Here are examples of the Sterling Issue £10 notes with the O'Neill signature, standard type and replacement. Both the standard type and replacement appear to be quite scarce and the replacement note is very tough to find in high grade. Standard issue, specimen and replacement notes are known. Images of the standard and replacement notes are attached. These notes are scarce particularly in high grade.